To mark the 50th anniversary of the five-piece Pink Floyd concert held in the Sussex town of Lewes, online community radio station Radio Lewes will be airing a show next month featuring people who had involvement at the time. As most of you will be aware, there were a handful of shows undertaken in January 1968, after David Gilmour had joined, and before the departure of Syd Barrett from the band. 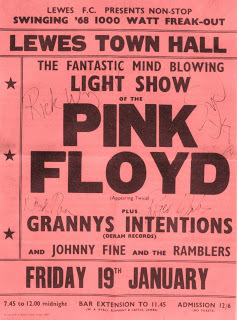 Pink Floyd appeared in the town, appearing twice on January 19th. Jenny Spires, Barrett's girlfriend, will be a guest on the programme, talking about him and her recollections of Pink Floyd. The broadcast will also include people who promoted or attended the concert and the memories of that night from the original support band, Granny's Intentions. It will be available from January 12th and for at least a month afterwards at RadioLewes.org.uk. The anniversary of the concert will also be marked by an exhibition at Lewes Town Hall from January 15th featuring exclusive photographs of Syd Barrett from the Barrett family, and other memorabilia associated with Pink Floyd and David Gilmour. Our thanks to Lee McLoughlin for letting us know about this.